For the first time in history, leaders and employees from 5 generations are interacting daily in the workplace... and this is an incredible concept to imagine. If you estimate that each 'defined generation' is considered to occupy a span of roughly 20 years (sometimes with overlaps), the life experiences and working-style differences across multiple generations are immense. Even more incredible is how technology advances in recent decades have accelerated the change in workplace communication and interaction norms - which some argue has further defined the delineation between generations. Step 1: Analyze. Do you know your company well? Possibly, but it is likely that you have not spent time analyzing the generational makeup of your employees, leaders or board members. This is very important foundational information to know. In order to initiate the process of harmonizing all of these generations into a cohesive, efficient and productive group to reach the optimal resonance within your company at the macro level, you must first understand what generations make up the entire workforce across your organization. I suggest creating a special project to gather this information and view the numbers as well as the percentages. Remember that you can also apply this concept at a micro level to projects, programs, lines of business, boards, etc. Goal of Step 1: Listing and breakdown percentages of your group's generations. For further detail, see EY's Analyzing Perceptions - Positive and Negative Characteristics of Members of Each Generation and be sure to further click on 'download the full version' for more great details. Have I communicated in such a way that reaches all of the generations within my company or group? Each generation responds differently to each type of communication medium (and even when, where and how each generation consumes content varies, as Kelsey Libert points out in her Inc. Magazine article). Another good article as a starting point on syncing communication to ensure alignment within your environment is Championing a Multi-Generational Workforce With Visual Communication by Matt Pierce. Have I created a rewards and recognition program that leverages the motivational chords across each generation? A multi-faceted reward and recognition approach may work best. Does the physical environment and office space in my company cater towards all generations? Or, does it look towards the future? For many companies the 'Age of the Cubicle' is drawing to a close, but there may be some value in designing multiple work environments within the same office space to accommodate generational workspace preferences. Office furniture companies such as Knoll have taken notice of the generational needs and published the whitepaper Generational Preferences: A Glimpse Into the Future Office - worth a read. Am I aware of each generation's optimal work conditions and have I created policies that foster flexibility and productivity? One may work best at a desk in a quiet office while another stays motivated while working at a Starbucks with a cup of coffee and a laptop. Some strategic thought in the area of workplace schedules may be in order, but I highly recommend doing this only once you have metrics in place to monitor work productivity and effectiveness. Do I understand each generation's learning and teaching styles? Many companies have spent unbelievable amounts of effort and money on training programs that are outdated and do not 'reach' their intended audience. Worse yet, they are either targeted towards one generation's style or have attempted to incorporate pieces of each generation's styles rendering the entire program ineffective. A great reference on learning and teaching styles by generation can be researched within the presentation Employee Training in a Multi-Generational Workforce on pages 11-15 (especially page 15). Know that this Generational Resonance exercise may be the most important thing you as a leader, C-Level executive or Board Member do within the companies you represent in the upcoming year. This process may even help clarify previous conflicts within your organization and prevent them in the future. Teams that do not work well together achieve very little - this is not only terrible for the company, but also can tarnish a leader's legacy. 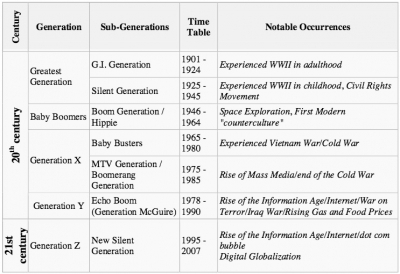 Is your company Harmonized and operating at its optimal Generational Resonance?